We had a litter from Bracken (Colly Moon) and had her out in the paddock near the day she was due to whelp.She came in and deposited a pup on my bed before giving birth to the rest of the litter in the whelping box. 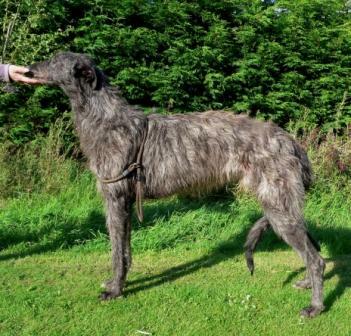 We went to our first Deerhound Breed Show in the early 1990’s at East Grinstead and had asked Dr Phyllis Poyner-Wall if we could sell our postcards there. We were pleased to find that the cards sold well with the money raised going to support our St Hubert’s Hound Sanctuary. 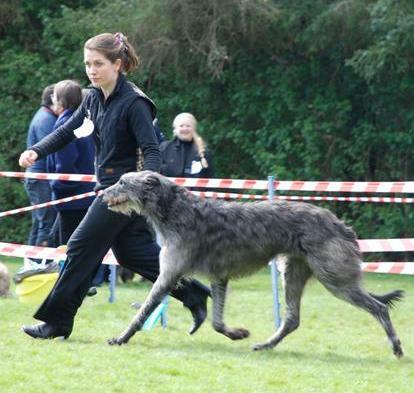 The most memorable aspect of the show was the mud and rain and Miss Noble organising races for the hounds. Bran won us a bottle of wine and a strong reprimand from Miss Noble about using a Gaelic affix which no one in England would understand! Ardkinglas, Miss Noble’s own affix, was not Gaelic but of course comes from Gaelic – we didn’t mention that. However, Cusidh it was and still is and hence the Cusidh Cards. Riding the Wind with Cusidh (Creubhag) Stud Book No. 1770CS and Leoch Fiddich (Dug) had eight puppies on 25th September 2009. One girl and seven boys! All are doing well. Click for pedigree chart. The pups now enjoying life outside. 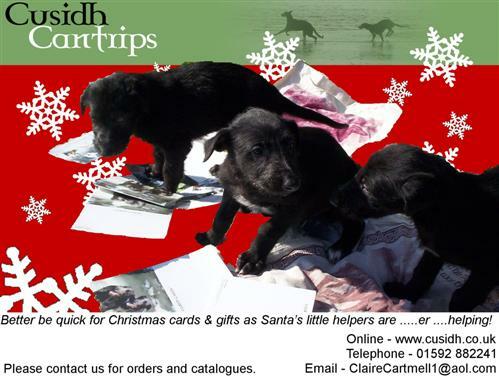 These pups will be looking for homes in December. Price £750 for KC registered pup plus veterinary inoculations. All pups now tested clear for liver shunt. New owners will receive veterinary confirmation. And here are more pictures of the pups helping out!. 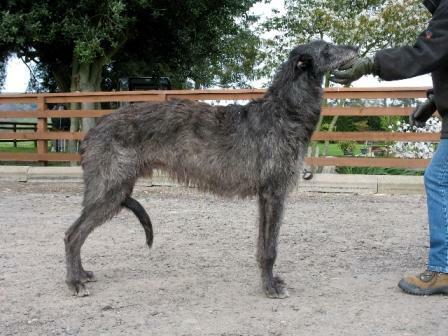 BBC Scotland's high profile new series 'A History of Scotland', featuring Cusidh scottish deerhounds is start on the 9th of November 2008. The Cusidhs will appear mostly in episode 4, but look out for them in episodes 1 or 2 also. If you miss the broadcast please look at the BBC website for details of their iPlayer service. Allowing you to 'catch up' on missed television.